The General Automobile Insurance Services, Inc. is a subsidiary of PGC Holdings Corp. Comparison shopping is an essential part of the car insurance buying process. If you’re a high-risk driver or have poor credit, you may have been recommended to try The General as they’re known to offer coverage to drivers who have certain factors working against them. Read on to find out how you can get a free quote from The General in just a few minutes. Then, enter your zip code on our site and answer a few questions to get matched with free, personalized auto insurance quotes. Doing so will help you weigh coverage limits and costs from various companies in order to settle on the best deal. 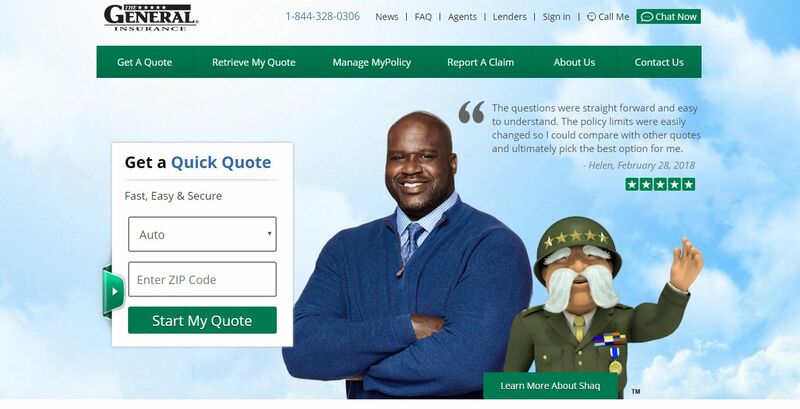 When you first land on The General’s site, it’s impossible to miss the picture of Shaq posing with the company mascot. The Basketball Hall of Fame star partnered with the company and has been featured in commercials and promotional ads. Celebrity endorsements might not sway you when it comes to finding a good car insurance provider, but it’s an interesting endeavor worth checking out when you’re evaluating The General. Read the company’s About page and find out about its origins and core values today. Are they more concerned with customers or coverage? What value do they offer me as a prospective buyer, and how do they seem to keep that value over time? At the top of the screen, you can find The General’s customer service number, schedule a call, or start a live chat with a representative who can answer any questions about auto insurance, costs, or the quotes process you might have. The General is known for its willingness to offer coverage to high-risk drivers who typically face extremely high premiums or flat-out rejections. The General specializes in high risk car insurance policies and SR-22 insurance. If you’ve had your license suspended or revoked or been charged for a DUI/DWI, then it will be difficult for you to obtain car insurance. The General is one company known to offer quotes to drivers with bad records or poor credit, and the company can help walk you through the process of filing your SR-22 and staying properly insured to avoid any further penalties. Enter your zip code on the homepage to start your request. The General has one of the fastest and efficient quotes processes we’ve encountered. The system cuts right to the chase and uses the minimal personal information to get you a personalized quote fast. Now you’ll want to provide some details about yourself and any other members of your household. All drivers of your vehicle should be included, but you should also list anyone who lives with you that’s over age 14. You can choose to exclude them later, but they should always be reported on quote requests unless otherwise stated. You’ll want your vehicle registration on hand for this part of the process. Enter your car’s year, make, and model using the assistance of the drop-down menus. If you aren’t 100 percent sure on the exact type, it’s okay to guess and make a final adjustment with the correct details with an agent when you purchase a policy. If you have an anti-theft device, make sure you select “Yes” so you can qualify for a discount. You can repeat this process for multiple vehicles in your household. You’ll be presented with an estimate for a 12-month policy that features only the minimum standard liability your state requires. If your car is financed or leased, then comprehensive and collision coverage will also be included in your estimate. To the right of your quote, you’ll find a breakdown of the costs. You can click “Quote Details” to view a complete breakdown of coverages. Because The General’s initial quote only includes basic liability, it isn’t ideal for those who want full car insurance coverage estimates for fast comparison. If your car is paid off and you don’t feel like you need the extended coverage of a comprehensive or collision policy, then The General might be a good choice. If you’re a high-risk driver or someone with poor credit who has had difficulty securing an auto insurance quote because of this, then the company might be worth exploring more. We recommend contacting an agent and getting a full estimate for a comprehensive and collision policy in addition to your state’s liability requirements. It might be tempting to go with the first cheap car insurance quote you get online, but the least expensive policies usually come at a higher cost elsewhere. Without adequate coverage, even a minor accident can leave you financially devastated. We don’t recommend buying coverage you don’t need out of fear, but you should find a healthy medium that gives you solid car insurance coverage for a reasonable price. Let us help you strike the right balance. Enter your zip code below to get free, personalized car insurance estimates today that you can compare. Then, when you’re ready, you can directly reach out to a local agent and seal the deal.